I know that cauliflower is not everyone’s favorite but if you haven’t tried it raw in a salad you are really missing out. 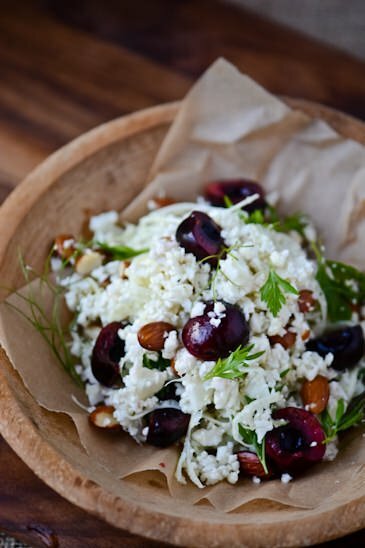 Chopped up into small pieces and tossed with almonds, fennel and sweet pickled cherries I can pretty easily say it’s unlike any salad you’ve ever tried. 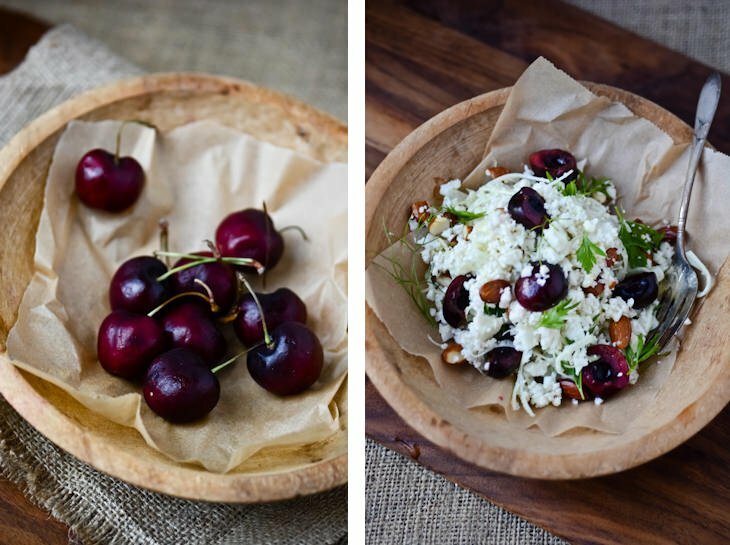 I’m adding it to my salad rotation and the cherries are out of this world good. The longer you let the cherries sit in the brine the more flavorful they become and don’t even think about trying to throw the liquid away, mix a few tablespoons with sparkling water and prepare yourself for one refreshing, delicious cocktail! Break the cauliflower into florets and place in the bowl of a food processor. Pulse the cauliflower until it is broken into small rice sized pieces. Alternatively you can chop the cauliflower finely with a sharp knife. Shave the fennel with a mandolin or as thinly as possible, reserving some of the fennel fronds for garnish. 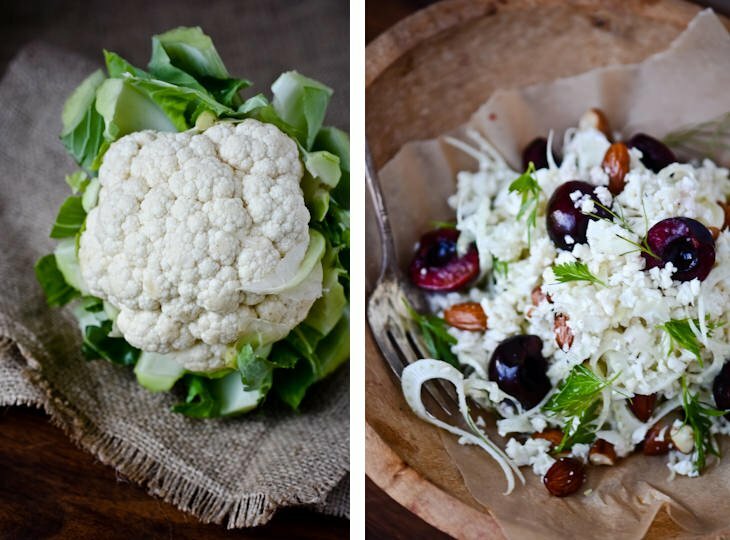 Place the fennel and cauliflower in a medium bowl along with the almonds, parsley and fennel fronds. Prepare the dressing by combining the vinegar, lemon juice and honey and stir until the honey is dissolved. Slowly whisk in the olive oil and season with salt and pepper. Pour the dressing over the salad and toss to combine. 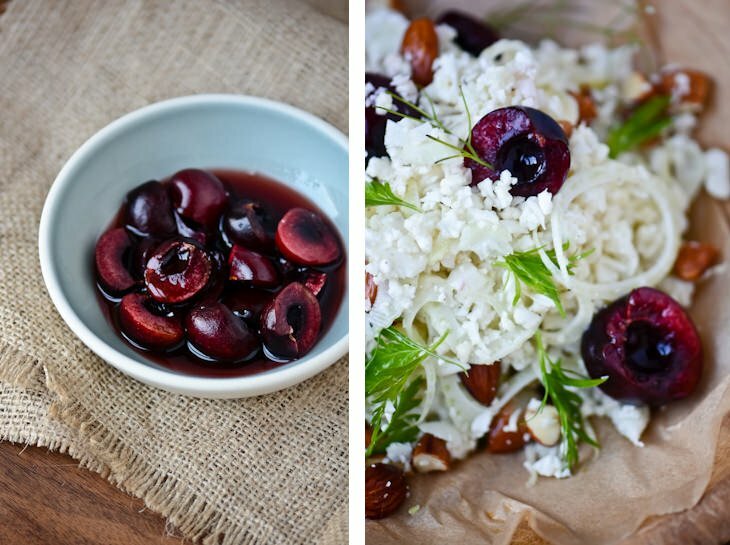 Plate the mixture and top with a ¼ cup of pickled cherries. Combine vinegar, sugar water and spices in a small saucepan. Bring to a boil; reduce heat and cook for 5 minutes uncovered. Pack cherries into jars and pour the brine over the top to cover. Let cool to room temperature before using; cover and store leftovers in the refrigerator for up to 3 months.